This intelligence, or what I'll call "the wisdom of crowds," is at work in the world in many different guises. It's the reason the Internet search engine Google can scan a billion Web pages and find the one page that has the exact piece of information you were looking for. 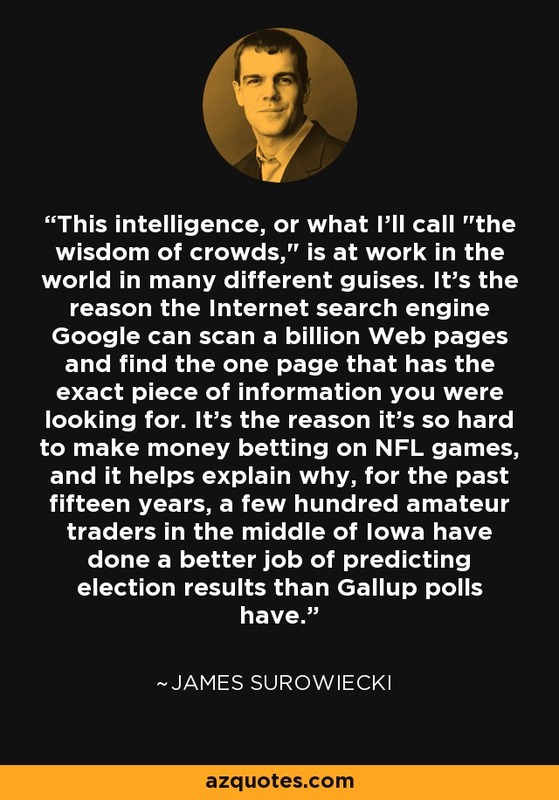 It's the reason it's so hard to make money betting on NFL games, and it helps explain why, for the past fifteen years, a few hundred amateur traders in the middle of Iowa have done a better job of predicting election results than Gallup polls have. "The Wisdom of Crowds: Why the Many Are Smarter Than the Few and How Collective Wisdom Shapes Business, Economies, Societies and Nations". Book by James Surowiecki, 2004.